Salsas and Dips always go well with a platter of Chips, Tortillas and cut Vegetables.I serve the dips and salsa even with khakras,a slightly healthier version when compared to chips.Tomato salsa is the most common variety in salsa but you can make various salsa varieties like Watermelon Salsa,Mango Salsa during their respective seasons. 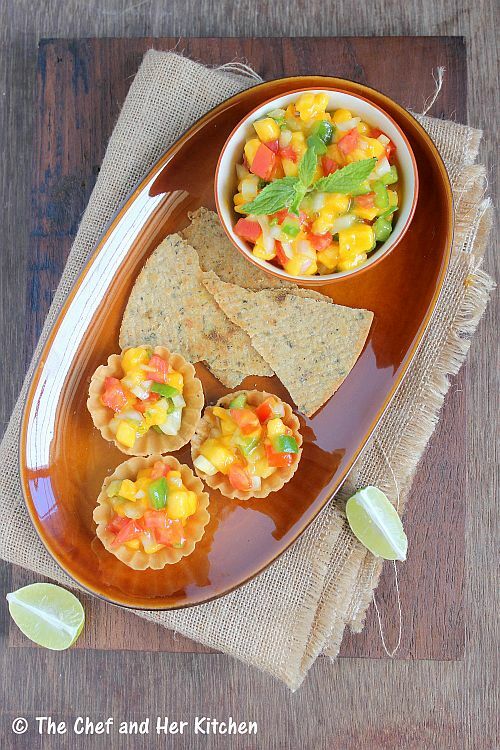 My most favorite one is Mango Salsa.It is a perfect burst of flavors with the sweetness of mangoes which is balanced with the acidity from lemon and the heat from the chillies. I prefer to use the mango variety called 'Banginapally' to prepare salsa as I love the peculiar taste of this mango which makes the salsa taste even better.But if you do not find that variety you can use any other sweet mango varieties like alphonso,kesar etc.The fibrous mango varieties might not suit as it is difficult to cut them into pieces.I feel that the salsa tastes best when it is prepared bit mushy and hence I cut them into very fine pieces.You can prepare the salsa bit ahead so that the flavors mix well.If you have not tried Mango Salsa recipe,try it before the mango season gets over. 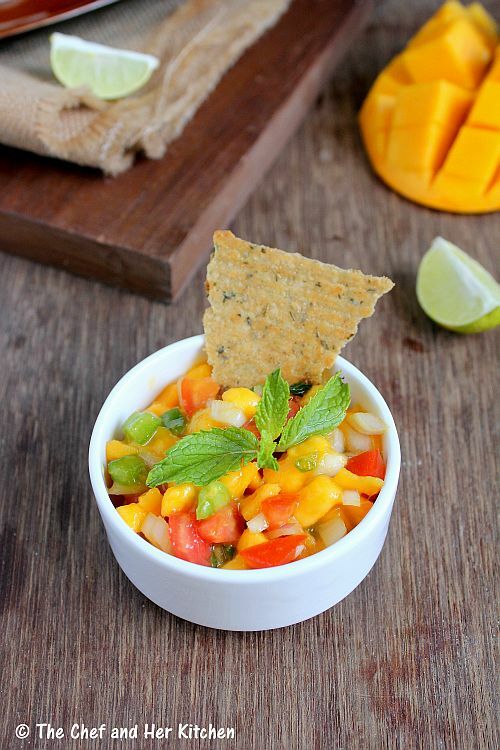 Remove the skin of ripen mango and chop it into fine pieces.I like to make my salsa slightly mushy,hence I cut it into fine pieces.You can even cut the mango into big chunks if you want. Remove the eye and seeds of tomato and cut it into fine pieces. In a bowl mix chopped tomatoes,onions,capsicum,green chillies and add salt and lemon juice to it and mix well. 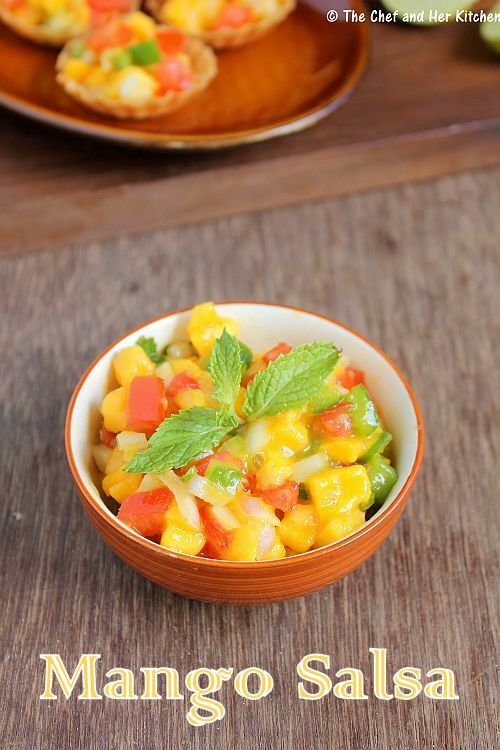 Add chopped mangoes,coriander and mint leaves and mix again. Now taste the salsa and add more lemon juice if needed.If your mango is not sweet enough,add a pinch of sugar at this stage. Leave it in refrigerator for half an hour for the flavors to mingle. 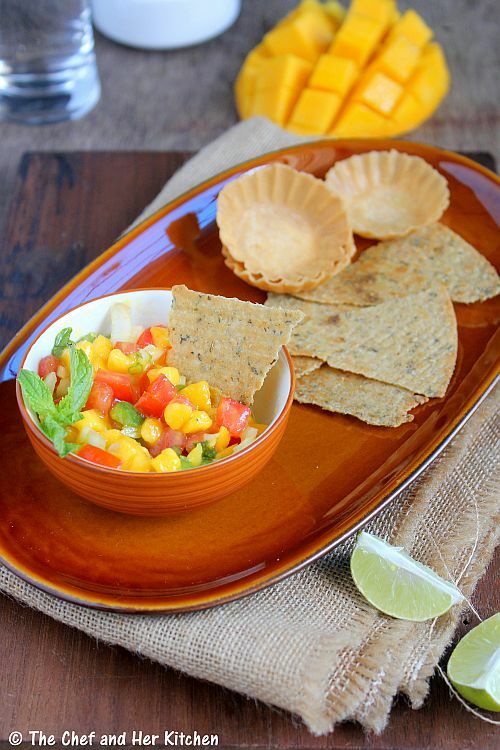 Serve it with Chips/Tortillas/Quesedillas/Tacos etc.You can even use it as a filling in Canapes or with Khakra chips like I did. You can use red bell peppers along with green capsicum in the recipe. 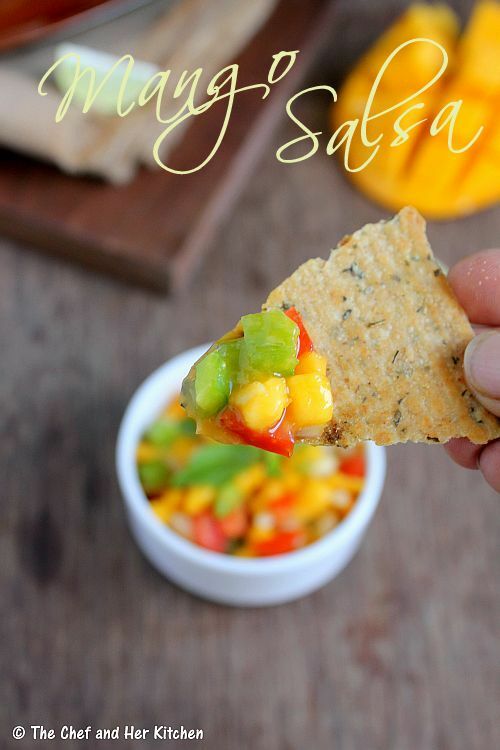 I like the taste of Banginapally mango for salsa and I prefer to make mostly with it.It is perfectly sweet and makes the salsa more delicious.If you do not get this variety you can use any other variety too. 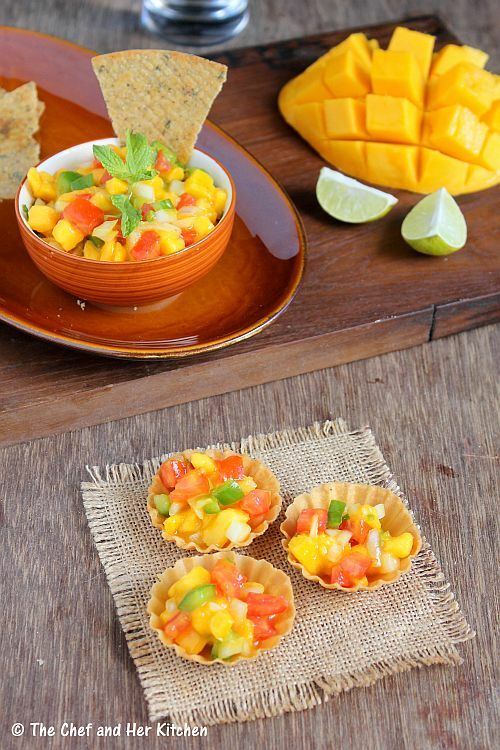 If your mango is not sweet enough you can sprinkle some sugar in the salsa. Use jalapeno peppers if you can find them instead of green chillies. Check out various recipes with ripen mangoes and raw mangoes here in my blog. looks colourful..feel like finishing that bowl right now.. 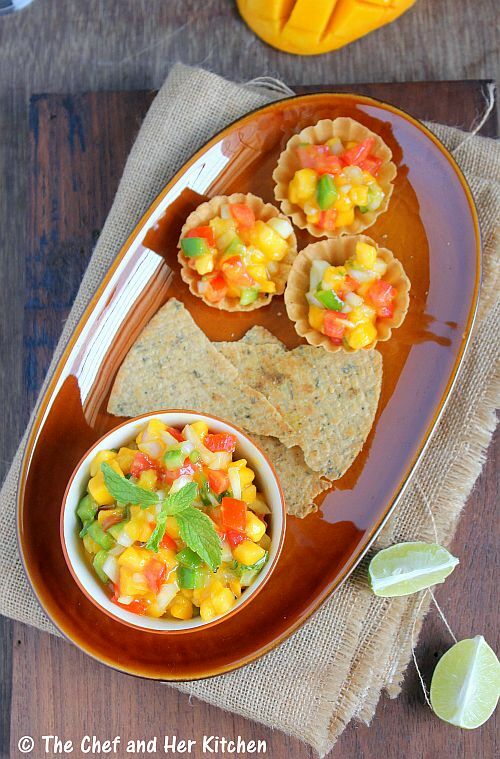 Very colourful and yummy salsa. Loved the Salsa and pics are too good. Your photography is awesome.. loved the presentation too !! Very vibrant and attractive salsa,just love it. One of my fav salsa's. Looks delicious. Nice colorful and wonderful recipe !! Beautiful colors, yummy salsa. Those khakras look great, did you make them? looks colorful, mouth watering & i will try.